On our first visit, we travelled through France,Luxembourg and Germany night stopping at Remich in Luxembourg and on the shores of the Gruntensee in Bavaria before arriving, on the third day, at Alpen Camping Mark in the village of Weer near Innsbruck . We stayed two weeks on this flat and level site which did not have any disabled facilities. However the small resturant and bar were accessible and the Tirolean village of Weer was a 5 minute stroll from the site. Austria is a beautiful country but on our first visit we thought it not the most wheelchair friendly. Toilets for the disabled were difficult to find away from major tourist spots and even when you find them, their design, very often left a lot to be desired. 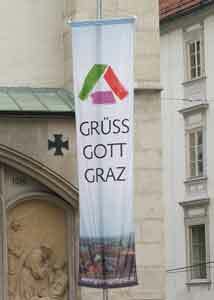 We even had difficulty in Innsbruck and the main Tourist Information bureau could not help ! One place where you can always rely on finding facilities is at a main line railway station and Innsbruck was no exception. Parking for the disabled was none existent although we always managed to find somewhere to park even if it was some distance from where we wanted to be. Innsbruck is fairly flat but has its fair share of cobbled streets with few dropped kerbs. There is a three stage cable car ride from near the river in Innsbruck to the top of the mountains 7500ft above. The views were spectacular. The first stage didn't look wheelchair friendly (it's a funicular) and because you can drive up to the start of the second stage we did so. Here there is level access into the cable car but there are a few steps to negotiate on alighting at the top of this stage. Here you can choose to pause for refreshment and return, or to go on further to the very top. We went on to the very top and paused for refreshment on the way down. We undertook motoring tours to Krimmler Falls, the ski resorts of Lech and Mayrhofen, Rattenberg (famous for glassware) and Garmisch just across the border in Bavaria. The drive to Krimmler Falls crossed the Grossglockner (toll payable) and was spectacular. The falls are worth a visit but because of the extremely steep nature of the path to the top, very little is wheelchair accessible. There are wheelchair accessible toilets in the Krimmler Falls and Mayrhofen car parks. 10 years past before our next visit, admittedly a short one whilst on our way in 2006 to and from Croatia. A notable change was the introduction of toll road charges and we were pleasantly surprised to find good wheelchair disabled facilities at Stadt Camping Graz and in Graz itself. If your vehicle is over 3.5 tons gross weight then you must prepay your tolls by buying a GO-Box. This electronic device sticks to your windscreen and debits toll charges automatically as you pass electronic way points. It can work out very expensive if you stick to the toll roads. For further information visit the "Go" web site. We managed outward and homeward crossings of Austria for the minimum Go-Box charge of 55 euros. We entered Austria via Passau in Germany, buying the Go-Box at a garage on the A3 in Germany near Passau. I was asked for my registration certificate and paid by credit card. We left the A3 on the German side to cross the border and take the toll free B137 to Wels where we joined the B138 to Liezen. This is a very good road and we made as good a time as if I had travelled on the toll roads. We joined the A3 Austrian toll road just after Liezen at Rottenmann to cross the Alps. (I don't think there is any alternative) to arrive at Stadt Camping in Graz for 2 nights. 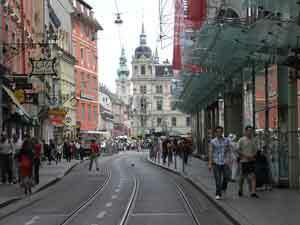 Graz is well worth visiting and there is a good wheelchair accessible bus service close to the camp site. This outward section of toll which included a major tunnel, cost the bulk of the 55 euros. From Graz, we took the toll free B67 to Solvenia. On our return from Croatia, we left Solvenia from Camping Bled, a terrific place to visit, travelling north on the A11 to cross into Austria and join the A10 Austrian toll road at Villach for the short trip to Lendorf where we joined the toll free B100 to Leinz (a little narrow in places but no real problem). From Leinz we took the B108 and B161 across the Alps, both excellent toll free roads apart from a cash payment for a tunnel toll. After a night stop in St Johann in Tirol, a pretty spot, we took the B176 and B172 to join the A33, a short toll section, to cross the border into Germany heading for Munich. The total Go-Box charges did not exceed 50 euros although I was warned quite early by the beeping of the box to top it up. I ignored these warnings in the belief I had sufficient money left for my planned route. This proved to be the case and I never did get the money expired 4 warning beeps although it must have been very close. In 2013 we had planned a 5 night stop over to visit Innsbruck on the way back from Italy. However weather and transport difficulties cut this short to just three nights. We stayed at Camping Natterer See in late May which had a free bus service into Innsbruck but buses on this route turned out not to be wheelchair friendly. We also had warnings of snow which may have prevented our journey northward so decided to leave before the bad weather set in. This did turn out to be the right decision. You can read more about our journey through Austria via a toll free route down the old Brenner Pass and up the Fern Pass in our blog of the trip here.